Welcome to Courtesy Gas. We have been serving St Augustine since 1950 as a family owned and operated business. We try to exceed expectations for each and every one of our customers by providing top notch customer service & courteous drivers. You can expect the highest level of professionalism because we value your trust and we will do everything possible to make your experience positive and safe. Visit our showroom and see our many services and products. We offer commercial, residential & agricultural propane gas. 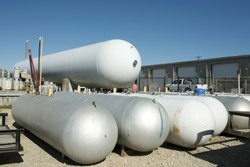 We are a full service company, which includes installation of tanks and other propane related products. We also have a filling station for BBQ grills, RV's and portable tanks. Propane is also known as liquefied petroleum gas or LPG. It comes from the refining of crude oil and natural gas, so the common misconception that propane is the same as natural gas is untrue. A little know fact about propane is when it is stored under normal pressure and above temperature -44F propane will remain in it's gaseous form. At lower temperatures and/or higher pressure propane will become a liquid. Propane naturally does not have any color or odor. 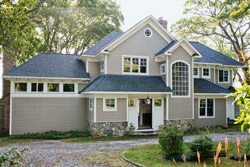 For safety reasons propane is required to have an odor and color added so it is easy to indicate the gas is present in the local area. Reliable propane delivery is crucial for your business. We are trusted by many local businesses to deliver the propane they need to keep their employees warm, forklifts running and customers happy. Give us a call today and see what we can do for your business! Can you imagine an endless supply of hot water? Whenever you need it? Now you can by using a tankless water heater. 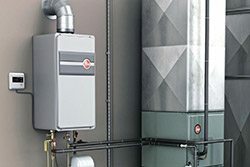 This technology will provide hot water whenever you need it and our Rinnai Certified Technicians will use their expertise in installing a system in your home.